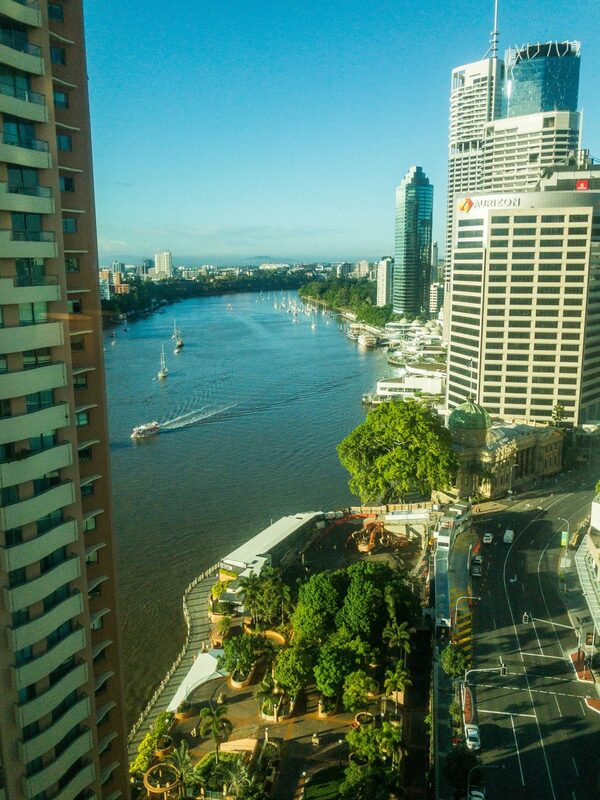 arrived in Brisbane at 5:30am Australian Eastern time on Saturday, April 21. There’s a 14 hour time difference between Brisbane and Hartford. That makes the total travel time 27 hours, 45 minutes gate to gate. I arrived at my hotel about 2 1/2 hours ago. Remarkably, they had a room they could give me, even though the official check in time isn’t until 2:00pm. It’s a very comfortable room in what appears to be a very nice part of the city. I don’t have any meetings until tomorrow. Once I’ve finished up a couple of things I want to do, I’m going to put on some comfortable shoes and go for a walk around town with my camera. First stop, the City Botanic Gardens. I’ll miss the farmer’s market, which is held tomorrow, and I’m not sure what I’ll visit after the botanic gardens, but I’m going to keep going all day. If I can go to bed at something resembling a normal time, there’s a good chance I’ll escape the worst effects of jet lag tomorrow. The photo is the view from my hotel room.